#2 “Are you sure that being like everybody else will make you happy?" DELIRIUM is a dystopian novel by Lauren Oliver. I picked this book up during the summer and literally flew through it. The idea of love being a disease really intrigued me, and the relationship between Lena and Alex kept me addicted to the story. Fans of Matched by Ally Condie will probably love Delirium- but no worries! Although they do have similarities, both series are still very unique! Now I'll admit, Lena was a tough character to warm up to. Her views at the beginning of the story made her really unrelatable. The good news is that once Lena meets Alex, her character really starts to change for the better. I ended up liking her a lot more by the end of the novel. 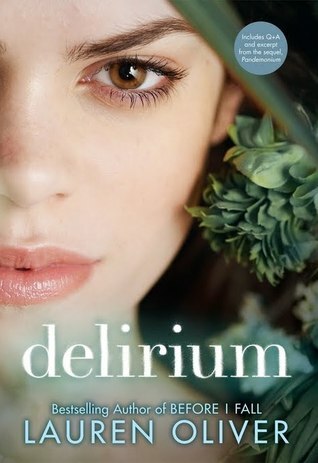 With every good dystopian novel, there is an equally good romance- and Delirium doesn't disappoint. The relationship between Lena and Alex gradually builds and results in a sweet love story (without being too cheesy :P) ! Delirium was a great read with a fantastic dystopian society, a budding romance, and a flippin' crazy ending. I have yet to read Pandemonium, but I am definitely anxious to start it soon! How did you like Delirium? What are your thoughts on "love being a disease"? Be sure to let me know in the comments! See you next Monday!